Part of the tamagaki. My name is on the left on the central pillar in the image. Koganëyama Jinja is on the island of Kinkasan, in Miyagi Prefecture. It is the nearest inhabited piece of land to the epicentre of the Great East Japan Earthquake of 2011, and the jinja was badly affected. Fortunately, the island is a mountain, and the jinja itself is located part way up the mountain, and thus out of reach of the tsunami, but the waiting room and other facilities at the piers were destroyed, many torii and stone lanterns collapsed in the earthquake, and the whole island sank a couple of metres, rendering the piers almost unusable. I have been visiting the jinja every year since 2013, which was when the piers were sufficiently rebuilt to make landing possible for ordinary visitors. Over that time, I have seen the progress of the rebuilding. The baths for people staying at the jinja were rebuilt a couple of years ago, as was the main torii at the foot of the steps leading to the main sanctuary. When I went this year, a new waiting room had been built at the pier, and the road up to the jinja buildings had been fully repaired. In addition, the stone fence, the tamagaki, along the sides of the steps up to the main sanctuary had been rebuilt. Most jinja do not get any assistance from the government, and thus have to find funds for rebuilding themselves. “Kinkasan” means “Gold Flower Mountain”, while “Koganëyama Jinja” means “Gold Mountain Jinja”, so this jinja has a reputation for being a good place to pray for material prosperity. This may have made it slightly easier for them to raise funds. One of the ways they did that was to offer the chance to sponsor the tamagaki. For ¥50,000 (about $500), you could have your name carved into one of the pillars. The photograph shows my name: チャート出意人. (My choice of legal Japanese name is literally set in stone now.) In principle, anyone can donate to these appeals, and have their name preserved at a jinja until the next major disaster. 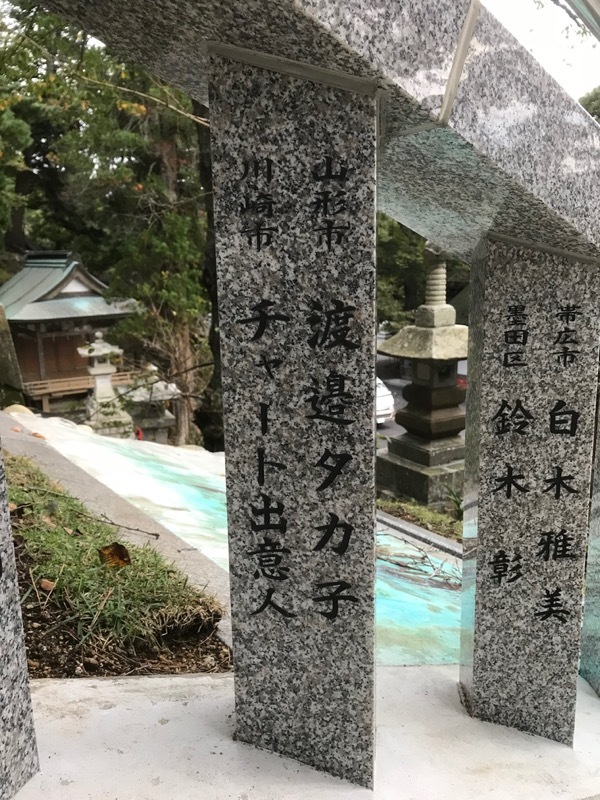 The limitations are, first, that they are typically only announced in Japanese, and second that you need some sort of connection to the jinja to hear about them. Otherwise, there are no restrictions on participation. It has been over six and a half years since the earthquake, and I would say that Konganëyama Jinja has only now finished rebuilding. This is a lot faster than any of the coastal towns I go through on my way to get there. It takes a very long time to recover from a disaster of this magnitude. Very interesting! Thanks for the English, now… what’s a “jinja”? A Shinto shrine, except that “shrine” is not a very good translation, so the current convention is to leave it untranslated.